I have quite a bit of time on my hands the next few days (as long as work don't call me in again ). So I thought this would be the perfect time to work on my unwatched DVDs and Blu-ray discs. I don't really have a goal in mind here... just want to see how many I can get watched. In honor of our good friend Roger, may he rest in peace, I decided my first film will be a Western. Since my entire John Wayne collection is in storage I will have to make due with The Lone Ranger. I decided to watch this one in honor of my good friend Roger who recently passed away. He was a huge fan of westerns... especially of John Wayne. Unfortunately all my John Wayne films are still in storage so made do with this one. I remember when I first heard about this film coming out I was surprised that Johnny Depp took the role of Tonto instead of the Lone Ranger himself. After watching this film I see why. The movie is different then I was expecting... but I still enjoyed every moment of it. I thought everyone that was involved did a good job... and the storyline, while on the long side, easily kept my interest. The film has some good Western action and adventure... but also comes through with a few laughs. Recommended. Interesting. 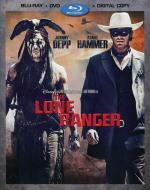 I've been avoiding The Lone Ranger, because I didn't like what I saw in the trailer. Maybe I should rethink that? I do usually like Johnny Depp, although I didn't much care for the later Pirates movies. Frank (Willis) is a former black-ops CIA agent living a quiet life alone... until the day a hit squad shows up to kill him. With his identity compromised, Frank reassembles his old team Joe (Freeman), Marvin (Malkovich) and Victoria (Mirren) and sets out to prove that they still have a few tricks up their sleeves. Stand back and watch the bullets fly in this explosive action-comedy that critics call "A rip-roaring good time". (Kevin Steincross, Fox-TV). Just finished this one. I really enjoyed it. 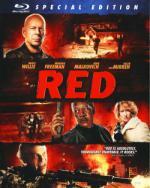 A real fun action flick with a lot of big name stars in it. Definitely well worth the time put in to watch it. Now I just need to find part 2 to add to my collection. I was a bit hesitant after first seeing the trailer too. Then a friend convinced me to give it a chance. As I said... I enjoyed it quite a bit. Not sure about you though... as if I remember correctly we have disagreed on films before. Now I just need to find part 2 to add to my collection. Sadly part 2 can't quite compete with the first, and if only because the first part put the marks so incredibly high. What comes around as refreshing and ironic in part 1 smells like "old jokes" in part 2. Thanks for the heads up... though I will still have to see it at least once. Well, if you say that the actual movie is better than the trailer, then I think I may give it a try. I won't hold it against you if I don't like it... And who doesn't disagree with someone at some time or other. It would be rather odd if we had the exact same taste in films. I have to get ready for work... so next movie will be watched tomorrow. I think that you might enjoy this. I grew up on the Lone Ranger and his faithful companion Tonto and this isn't that So if you can let that go .. this is a very entertaining film. Johnny Depp is as good as he has ever been (except for Benny and Joon where he was inspired). There are some cheap shots at the original series and I always laugh (just watched it last night with my daughter and she just looked at me when I was laughing). The last minute of the show is hilarious ..
Well, I didn't grow up with Lone Ranger. We didn't get the TV show here in Sweden. I do remember the comics, but they weren't something I read. I don't think they were very big over here. So not being faithful to the original won't be a problem for me. Well... I don't know how much I will get to watch today (if anything) was supposed to be off today... but that didn't work out. They called me in once again. I will be taking my day off tomorrow if they ask me to work or not. After 11 days straight... I was like the walking dead in there last night.